I’m back from this two-week trip to Rome, but I haven’t gotten the Eternal City out of my mind. Not by a long shot. Thus, this entry, which has a ghoulish picture in it. I think it’s an appropriate meditation on death for November. In Rome there is a famous church dedicated to the Immaculate Conception, and run by the Capuchins. What is most famous about this church is nothing in the church itself, but the nearby crypt cemetery, which the Capuchins decorated in a macabre way. The bones of four thousand of their deceased confrères are displayed in niches and on the ceiling in a very dramatic and artful fashion. 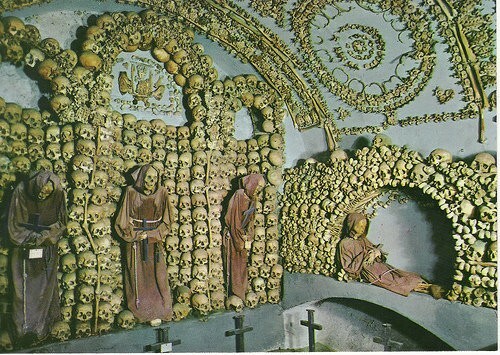 Some whole skeletons are standing, dressed in their Capuchin Franciscan habits, but most are collected by “category” and displayed in different symmetrical patterns. For instance, hip bones are delicately fanned over against each other in circular patterns, while femurs find themselves in another pattern elsewhere. Even the lamps lighting the narrow walkway through this miniature necropolis are made of friars’ bones. This unique work of art is to be seen in an underground passage, 40 meters long, to the right of the church. It consists of a corridor and six arched compartments. Pope Urban VIII had the soil of the cemetery conveyed from Jerusalem. Pope Pius VI granted a PLENARY INDULGENCE to the faithful who visit it on the first Sunday of October. The cemetery contains the bones of some 4000 Religious who died here between 1528 and 1870. The three small skeletons that are seen in the sixth compartment, are those of two young princes and a princess of the Barberini family, grand-nephews and grand-niece of Urban VIII. On the right of the arch which serves as a Chapel, is prince Matteo Orsini clothed in the Franciscan habit; on the left is the princess Maria Peretti, grand-niece of Sixtus V; in the wall in front of the altar is the urn containing the remains of a Patriarch of Jerusalem; in the tomb in the center lie the bodies of the Papal Zouaves who fell defending the Porta Pia in 1870. The author of this artistic work, which probably belongs to the eighteenth century, is unknown. 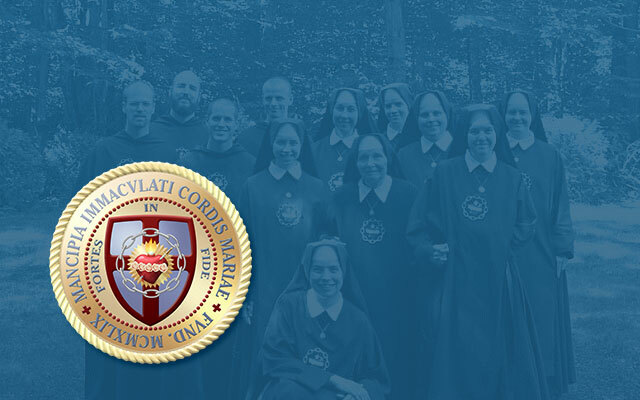 The tradition is that the work was executed by the Religious under the direction of a French Friar. Whoever the author may have been, he has succeeded in creating a marvelous work, unique in its kind which attracts numberless visitors without in any way taking from the religious character of the cemetery. The little crosses that mark the resting places of the dead and the mummified remains, in a standing or a recumbent position, remind the visitors of the drama of life which ends in death; while the fantastic designs worked out in human bones on the walls of the arches, invite to prayer and meditation. The statement that this work is “unique in its kind” is not accurate, for the Capuchin Friars have a similar thing in Palermo.